— This article by Jerry Cates and Kurt, first published on 13 February 2010, was last revised on 23 April 2016. © Bugsinthenews Vol. 11:02(07). Thanks for your website on venomous critters. It’s very concise and helpful. Your theory on MRSA versus brown recluse bites seems entirely likely. I have a shop facility here (northeast of Dallas) where I caught the fine specimen shown in the attached photo. He (?) was behind a wall panel which had been removed to service the plumbing. He was very patient until I trapped him, but the heat was turned down and perhaps the 55 degree temperature made him sluggish. It was also daytime. I trapped him in a bubble pack that had held a roll of solder. As I was taping the bubble down, he was banging against the side trying to get to my hand! We released him in a dilapidated, abandoned barn. But I am concerned that he might have relatives still at my shop. The facility was built in 2004 on rural grass land, so I’m the invader. I have successfully reduced the wolf and black widow population by reducing prey (I have copperheads too!). Spitting spiders have also been fairly numerous. What recommendations do you have to help me keep these out of my shop? The Photograph: The original image was excellent. I cropped and gently processed it to conform to the imagery used on this website, and the resulting image shows a frontal view, from above. This is a good perspective for almost any spider photo because it usually provides a good view of the eye arrangement. 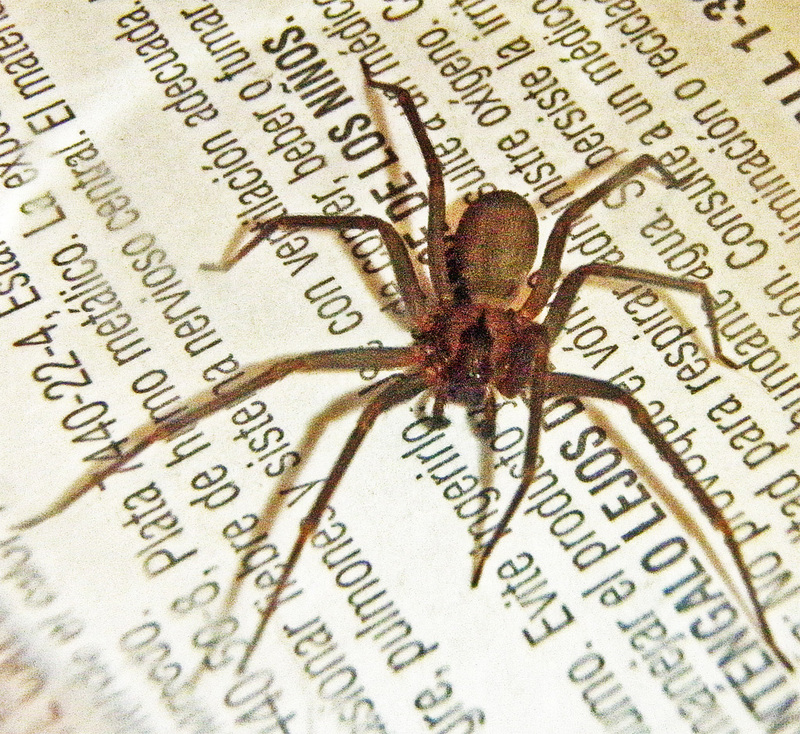 Brown recluse eyes, however, are sometimes (though not usually) rather small. They are also fewer in number than for most spiders, thus they are often not easy to see unless under magnification. Some specimens have bright eyes that are not obscured by surrounding setae, and can be made out from a distance; others are so obscured that even under magnification they are hard to see. This one is in between those two extremes. Only two of this spider’s six eyes are visible in this photo, reflecting light from the camera’s flash. Unfortunately, that doesn’t tell us anything about its identification, because a distant view of most eight-eyed spiders typically show light reflecting from only two eyes, too. Fortunately, though, we don’t need to count this specimen’s eyes to arrive at a firm identification. Other visible anatomical features obliterate all doubt. The following notes refer both to the photograph and the line drawing I made from it. Click on either to view larger versions. Flat Carapace: All the recluse spiders in the Sicariidae family, and the genus Loxosceles, have carapaces (the dorsal part of the cephalothorax) that are conspicuously flat overall, including the slightly elevated cephalic region. This would not be a big deal if lots of other spiders had carapaces that were as flat as a pancake, but it so happens that in most other species the carapace is humped (convex) overall. 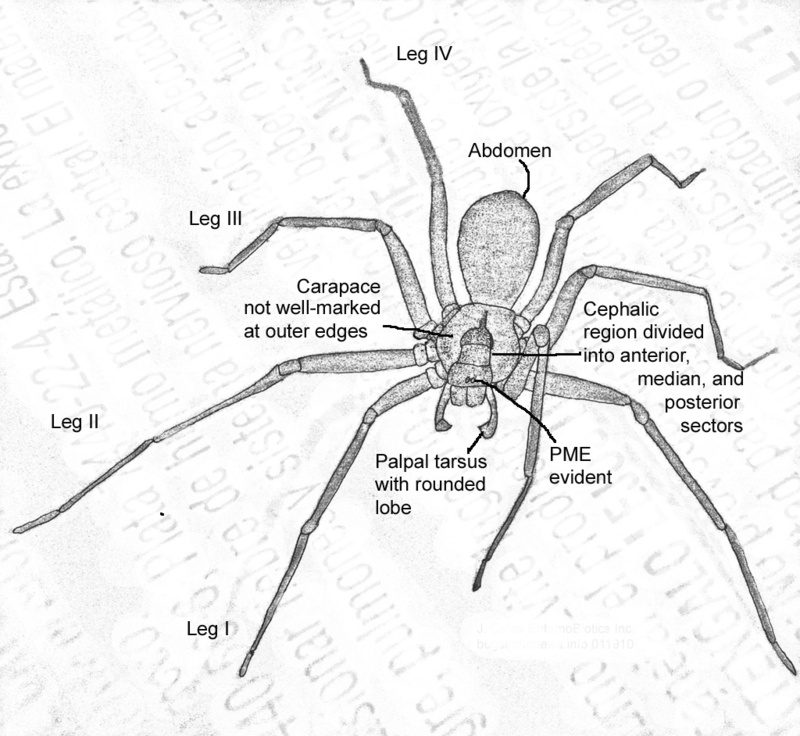 Besides the recluse spiders, the nursery web spiders in the Pisauridae family, including the fishing spiders in the pisauridine genus Dolomedes, and the long-legged water spider, Trechalea gertschi, are other examples of spiders with markedly flat carapaces. None of these, by the way, is likely to be mistaken for a brown recluse. Distinctive Cephalic Region: Note that this specimen displays three separate sectors to the cephalic region (the anterior, or forward, section of the carapace). The anterior, or frontal sector, which includes the eyes, is robustly pubescent (hairy) and much darker than the glabrous (smooth, with few or no hairs) thoracic region that flanks it on either side; the median sector is also more pubescent than the adjacent thoracic region, but less so (the setae here are seen under magnification to be arranged in longitudinal rows, rather than consistently throughout the sector; these rows appear similar to the strings of a fiddle, giving the spider its common name “fiddleback”) than the anterior sector in front, or the anterior sector behind, thus its coloration, while darker than the thorax, is not quite as dark as the rest of the pars cephalica; finally, the posterior sector is about as darkly pubescent as the anterior sector, and terminates, posteriorly, in a dark thoracic groove that extends along the midline of the pars cephalica to the posterior edge of the carapace, appearing to form the neck of the “fiddle”. During the last week of January 2010 I visited Kurt’s shop to see where the brown recluse he photographed was captured. This is a high-technology shop that is extremely tidy, totally without clutter. It is also spacious, and situated on a lot cleared of debris and flora around its perimeter. It was impossible, on this visit, to speculate with any sense of certainty on whether this spider wandered in from the surrounding area, or if it was brought in with some of the equipment that is in use there. Either seems equally probable at this point. Kurt and I will keep in touch as he uses the essential oil spray and granules I brought with me, to see if he observes any additional brown recluse spiders or copperhead snakes in the future. —Questions? Corrections? Comments? BUG ME RIGHT NOW! Feel free to e-mail jerry.cates@entomobiotics.com. You may also leave a comment in the space provided below. believe that I let it get pain 4 weeks after knee replacement out of bed, or a problem with the sciatic nerve.